Would you say no? Drive 12,500 miles from London to Saigon in 63 days, exist with a bare minimum of kit, spend most of your time behind the wheel, camp out, not bathe for days at a time, exist on the local cuisine, including kumiss (fermented mare’s milk), sheep’s lung, sea cucumber and jellyfsh? I said yes. I happen to like a little bit of adventure. And an adventure it was, being robbed in Russia, chased by the Hungarian police, chased by a Bactrian bull camel and getting lost in the Takiamakan Desert, but the best part of the adventure was when I returned home. Pursuing media coverage for my sponsors, Lada Cars (yes, I made it all that way in a Lada), I phoned Autocar Magazine and asked if they’d like to do a piece on me and my robust little 4X4. The editor promptly asked me if I’d like to write it. I said yes. I happen to like a little bit of a challenge.To my astonishment Autocar published my piece and PAID ME. After cashing a cheque equivalent to my week’s wages, I walked across the road from the bank to my local bookstore and bought Cathy Smith’s book on How to Write and Sell Travel Articles. No more nine to five! I thought. Yippee! I’ll write for a living! Yes, well. Writing freelance travel articles was fun but not nearly as lucrative as I’d hoped, and it didn’t take long before I crashed back to earth and returned to normal life. Monday to Friday, nine to five. Waking with the alarm and wishing it was the weekend. Lying in bed until I was running late before bolting to the shower. Struggling into stockings with damp legs, laddering them and having to start all over again. Slamming the door behind me to realise I’d locked my keys inside. Finding my car frozen solid. Getting to work to have a colleague tell me I still had toothpaste on my chin . No, no, no, I remember thinking. Writing’s so much more fun. I LIKE WRITING. I like writing A LOT. I can be my own boss, independent, autonomous, and I can get up when I like, wear what I want...Suddenly inspired, I thought: I’ll write a novel! Then the rejection letters came through. Weirdly they simply made me more determined. Not good enough, I thought. Try again. Read more. Go on some courses. You want to be a writer, you have to LEARN to be a writer.Over the next six years (yes, six, I’m a slow learner), I wrote and sold articles on the holidays I took; Ethiopia, Namibia, Sikkim, South Africa, Transylvania. I went to endless movies, studied film-script writing, survived a variety of hideous nine-to-five jobs, attended creative writing courses, wrote three more books, received a mountain of rejections, drove from London to Cape Town (not in a Lada this time), and finally settled down to book number four, Blood Junction. I was mulling over various ideas for the book when I saw an article on the ‘stolen generation’, where during the 1950’s over a hundred thousand Aboriginal children were forcibly taken from their families and adopted by whites. Most of these children were mixed-race, with paler skin than their siblings, and although some of these children, now in their forties and fifties, have been reunited with their families, some still have not. Several things struck me about this. There was the spectre of genocide, to ‘breed’ the Aborigines white. There was the struggle of the ‘stolen’ child being brought up in an alien world, only able to trace their blood relatives when they were adult.And what of the parents of these stolen children? The grandparents, the cousins, Aunts and Uncles?What would happen if a whole Aboriginal family went missing today? Would anyone contact the equivalent of the UK’s Missing Persons Helpline? Who would take up their cause if it wasn’t a relative? The police? The authorities? I was also interested in how a character reacts when they’re in a strange place and caught in events beyond their control, being accused of something they didn’t do and nobody listening, nobody wanting to listen. (I can give myself goosebumps all over simply by picturing myself alone at the Malaysian-Thai border when the guards find a kilo of heroin in my backpack and I’ve no idea how it got there and no idea how to extricate myself from the situation. ).So I put my heroine in a perilous position. On holiday one minute and accused of murder the next. 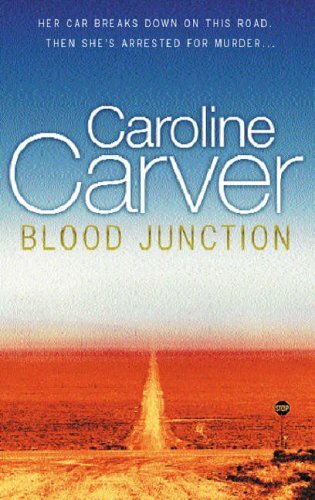 Accused of her best friend’s murder, in a dusty outback town she’s never seen before, India Kane is faced with not only proving her innocence, but seeing justice done, and seeking revenge.Blood Junction is a thriller, and writing thrillers, I’ve discovered, is right up my street. Not just because of my love of adventure, but probably because I’ve been scared witless a few times and know how it feels. In Blood Junction, India Kane runs like stink too. Caroline Carver enters the patisserie and suddenly all eyes are on this stunning looking woman. I was a bit nervous because I couldn’t make the interview set for the previous day. After making my apologies and ordering the coffees she smiled and said, "Do you know, you are the first man to stand me up?" Infamy. That said the writer reacts thrilled when I say I haven’t got a batch of set questions but prefer a more informal approach. We have met on several occasions and I have always found Caroline to be great company. When we last met at Bodies in the Library event at Heffers in Cambridge we spoke a little about India Kane and what she will be up to next. So I wondered if it still held true that she would be appearing in the new book. "She does and has a bigger role than I thought. But she doesn’t have a point of view in it. I’ve got another heroine. India happens to be in the area where the book is set. Which is in the far north of Queensland and India is up there investigating a story which coincides with my new heroine. They do team up but very briefly." This suggests that the new book, which she was unable to let me know the title of, is going to be in the same vein as Blood Junction. "Yes, an adventure thriller type of book, I love writing in that style. Especially about hostile territories. I love the monsoons, the wilderness, the mangroves and crocodiles. They do have the biggest man-eating crocodiles in the world up there, growing up to eighteen foot. I just like the thought of sticking my heroine in there and say get on with it! I’ve only just delivered the manuscript, so I can’t give you any details of publication date or title, I’m afraid." Caroline is the British-born daughter of a mother who in 1957 set the land speed record in Australia and a father who was a jet fighter pilot in the Aussie Fleet Air Arm. 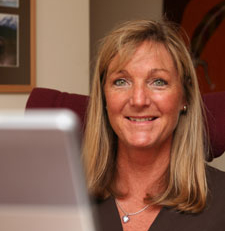 In 1998 she completed the London to Cape Town Rally, with an all-female crew, and during 2001 participated in the Inca Trail Rally around South America with the same co-driver. It wouldn’t be hard to say that she has adventure in her blood. "I did two months rallying around the trails in South America and it was almost two months off of writing. It was incredible, setting down in a different place every night and I tried to sit and write but found I was too shaken up by the rough journey to put pen to paper." Previously Caroline has travelled widely and adventurously: back-packing in South-East Asia, walking in New Zealand, trekking in Nepal and riding a camel through the Thar Desert to name just a few of her travel experiences. All of this has provided Caroline with a great wealth of background information. These are not the run of the mill tourist destinations and provide some very exotic locations. Add into the mix that she was one a freelance travel writer it made me wonder if there was anywhere that caught her fancy. "I was thinking of America and the Nevada desert; using that as a setting after writing Blood Junction. How many people actually get to go into the desert? The place is so hostile. I don’t like writing just about a hero getting in trouble with the bad guys, the surrounding environment is important to me." In that way, the terrain becomes a character itself. "It does become important. Think of writers like Steve Hamilton’s A Cold Day in Paradise, I felt freezing reading that, and also Jenny Siler’s Ice. I think the weather can be critical to a story. What better to have a whacking great storm like in the ending of Blood Junction. If the weather is too calm and sunny it makes like much too easy for the characters, I’d rather have them battling against a Force 8 gale. Just pile it on thick and let the characters get out of it." When I told her how much a first hardback edition of Blood Junction was being touted by the dealers for she was taken aback. "How much!! £150. I didn’t know that. I’m keeping hold of my four copies! That’s curious and frightening." It was sheer determination on Caroline’s behalf that got her published. She sent in the first chapter of Blood Junction to the annual Crime Writer’s Association writing competition in 1999, and won. Winning the competition brought Caroline the assurance of getting an agent and the book published. "Obviously winning the Crime Writers Debut Dagger Award helped a great deal. It’s thanks to the CWA that I got published. The interest from the publishers and the media was just terrific. It made a change of you having to run around after them and bash your head up against the wall. My publishers, Orion, were really excited." With the accolades dying down, just how much pressure in placed on a new and exciting author to deliver the second book? "With Blood Junction there was no pressure, I could write it at my own pace, enjoy it, polish it and polish it. Where with book two, they want it now and the pressure is on. It was delayed because of the Inca Trail, and when I was on that most of my creative brain was taken up by the rally. I was waking up in the morning with the ideas, thinking about the characters, meanwhile I’m filling up the Jerry cans. I remember at one point my co-driver said, stop writing the book, it’s driving you nuts. So that’s what I did. I did the rally, came back and got on with the writing because I didn’t want to be known as a one-book wonder!" At the moment she loves listening to South American jazz which shouldn’t be unexpected nor that her favourite drink is Caipirinha, the Brazilian national drink, made from a high-proof sugar-cane alcohol called Cachaca, blended with fresh lime, sugar and loads of ice. She cites her favourite book is Adrift, by Steven Callahan, "Seventy-six days lost at sea, his story on how he survived in a 5ft inflatable raft after a whale hit his yacht in the mid-Atlantic. An extraordinary tale of courage and determination . An incredible story and one I've re-read countless times. Probably not the book for a desert island!!" And The Usual Suspects is up there amongst her top films, admitting that she loves surprises (well, I didn’t make our first interview!). Compared to many other writers, Caroline has led a fascinating and exciting life. "I don’t have any major rallies lined up. So I can get on with book three without too many distractions." But I have a feeling that she may hear the call of the wild, jump on a plane and head off to the Sahara at any given time. Maybe that’s book four….